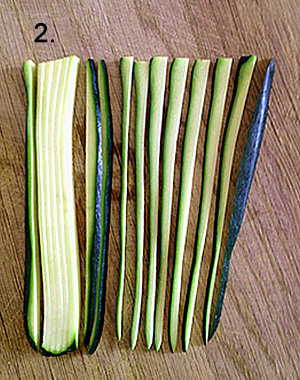 These thin strips of courgette/zucchini are an absolute star if you are trying to cut your starchy carb intake. They make for a light and nutritious alternative to pasta and noodles, not only cutting out the inflammatory effects of processed grains, but increasing your intake of healthy veggie carbs. An all-round winner! If you don’t have a spiraliser (this is the one I use) or a fancy food processor attachment to create thin strips of courgette, you can cut them by hand. It only takes a few minutes to do, and you can even do them in advance and store the strips in a sealable bag in the fridge. 1. 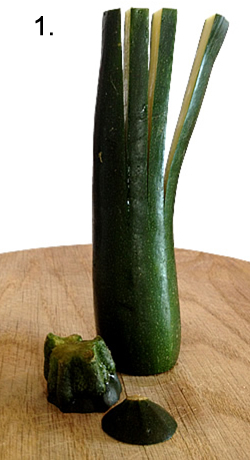 Top and tail a courgette and stand it up on its end. courgette approx. 1/2inch or 1 cm in width. You don’t have to be exact. cut through but trust me it’s easier this way. 2. Take each of these lengths and lay flat on the chopping board. Cut each length into strips approx. 1/4inch thick. You can cut the end skin strips into two if you like. There you have courgette strips ready to sauté lightly instead of pasta! You can make these strips thicker if you prefer, or thinner to use as voodles. Just remember to adjust your cooking times accordingly. You can, of course, not cook these at all and have them as a lovely smooth, raw accompaniment to any sauce you would traditionally serve with pasta or top with your oriental masterpiece.